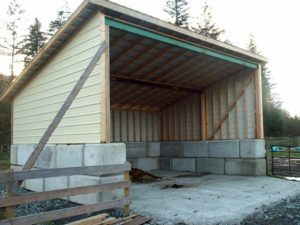 Now that you know the volume requirements of your compost system, it is time to start building it! 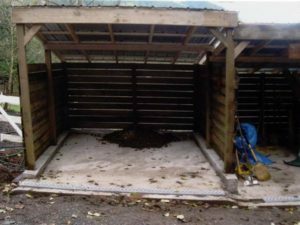 There are many different styles of compost systems to choose from. When selecting a system you must consider your individual needs, the needs of your farm and your budget. This section of the website focuses mainly on the construction and maintenance of the bin-composting method, but for more information on other system designs see our Land Management Guide. 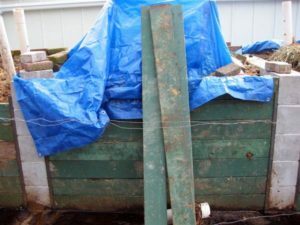 It is best to have at least three sides to your compost system so that you are better able to pile the raw material up in order to generate sufficient heat. Walls also help heat to be retained which will cause the material to degrade more quickly and evenly throughout the system. 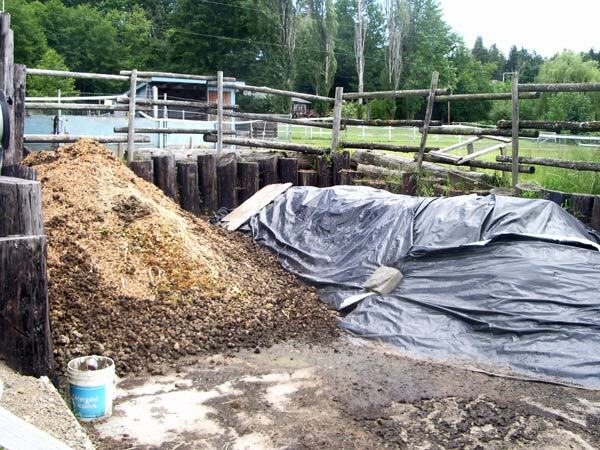 Though you can compost in large piles, there is a greater surface area exposed to the elements and so heat retention will be reserved only for the middle of the pile and the outer “shell” will not compost very well, if at all. 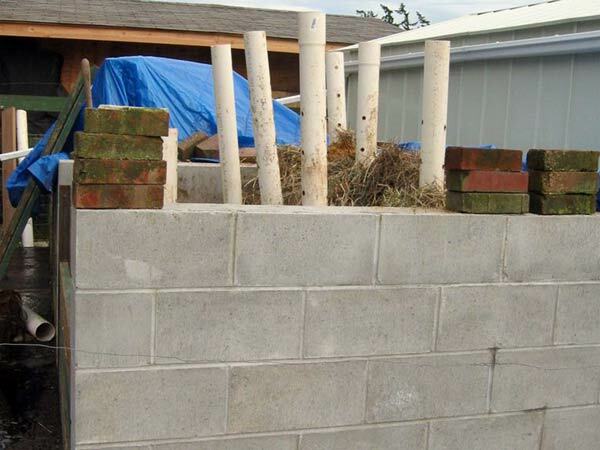 Other building material options include using wood for the framing, or a wood frame with chicken wire for the walls. Your imagination is the limit! Though budget may be the driving force when considering your choice of materials, keep in mind that you will be managing a system that promotes deterioration of organic matter, this includes wood. Consider how often you will need to replace wood and the costs associated with doing so versus a more permanent structure. 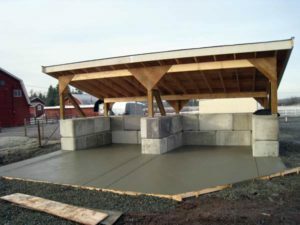 While your walls can be built out of just about anything, we do recommend that the base is a poured concrete slab. This way you will ensure that leachate is not escaping from your system. It also makes it easier to load and unload your system without damaging the ground. 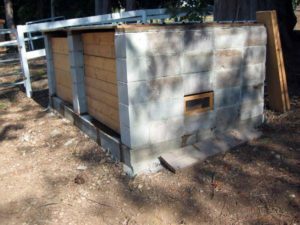 With a sealed site, your base should be sloped 2-4% toward the back of the system with a small lip at the front to contain leachate. Tractor traffic on the compost system access points can be very heavy. It is important to consider this when designing a system. 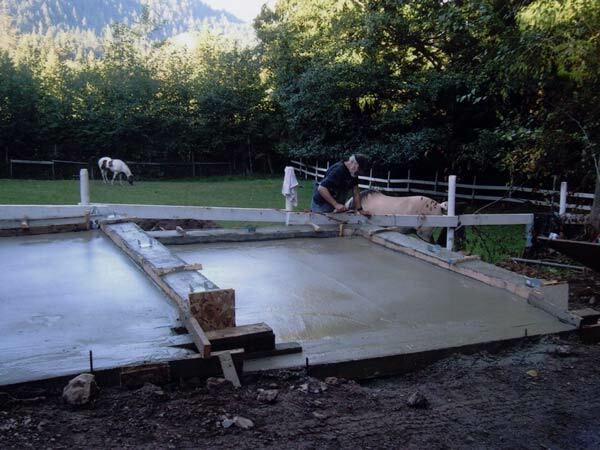 If you are pouring a slab, it is recommended to pour a large enough area for the tractor to work on, particularly for when it is pulling in and out of the system to load the system or load a manure spreader. If you are not pouring a slab, consider putting gravel in front of the system to handle the tractor traffic. Another consideration is the prevention of runoff of leachate. If you are pouring a concrete slab, the slab should be sloped in a fashion to prevent the escape of any leachate. If you cannot install a concrete slab, our recommendation is to berm the storage area to divert clean runoff from penetrating the system and to contain system leachate. Regardless of the type of composting system you choose, it is critical that it is covered, and doing so will help you to comply with provincial regulations. If a roof is not in your budget, at least a tarp must be used. 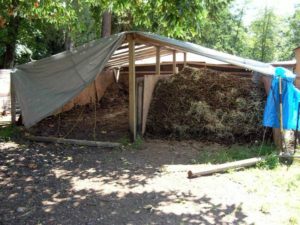 If you are planning to cover the system with a structure more permanent than a tarp, how do you plan to cover it? Will you build a shed-type covering or explore the option of a semi-permanent structure such as a coverall building?